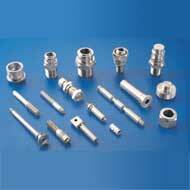 Passivation is a chemical treatment for Stainless Steel, not an electrochemical process. When Stainless Steel is machined, stamped, drawn, heat treated or in any way worked with, it is possible that its corrosion resistance has been compromised by the presence of metallic (primarily iron) or other impurities on the surface. By immersing the formed part in a Passivating Solution, these impurities can be removed leaving a surface layer that is rich in chromic oxides. Why Stainless Steel Is "Stainless"
Chromic oxides are extremely corrosion resistant and are the major factor as to why stainless steel is "stainless." Passivated surfaces are also fingerprint resistant. Passivation baths are typically Nitric Acid or Citric Acid based. The composition of the stainless steel alloy is usually the determining factor in choosing which bath is used. Contact Hi-Tech Plating today to discuss your particular requirements for passivating stainless steel application. Stainless Steel owes its corrosion resistance to the high levels of Chromium (>10%) which form stain resistant chromic oxides on the surface. There are more than 150 different types of Stainless Steel. The invention of modern stainless steel is generally credited to a British metallurgist who was trying to make better gun barrels. The star at the top of the Rockefeller Center Christmas tree weighs almost 800 pounds and is made of stainless steel that is adorned with 25,000 crystals. Stainless steel can be electropolished to a mirror-like finish. The Chrysler building's arches were clad in stainless steel in 1930 and are still looking good.